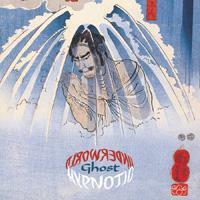 Though I've not heard any of the previous albums by Japanese psych rockers Ghost, I have heard a few of the earlier and solo recordings of their apparently eccentric and reclusive bandleader, Masaki Batoh. On those earlier recordings, it was clear that Batoh had a fascination with both heavy Hawkwind style space rock and lighter, more minimalist acoustic folk music with a spacey edge to it. By the time of 2004's Hypnotic Underground, Batoh, along with the various other members of his band, has developed the sound into a complex amalgam of psychedelic and progressive rock, experimental jazz, and world folk music. Hypnotic Underworld begins with the bizarrely structured 4-part title track. Part one is a mesmerizing 13½-minute exploration into colorful, spacious free jazz, reminscient of the classic late 60's and early 70's albums of Sun Ra and Pharoah Sanders. The 7-minute long second part adds some rhythmic elements to the jazzy feel, with dark and seedy, deep city night textures wrapping around a slowly developing piano riff. After twenty odd minutes of this complex, exploratory jazz, one is scarcely prepared for the explosive 3-minute long part 3, an over the top progressive rock track complete with freaky space synths, heavy, power chording guitars and Mellotron choirs! And one is left quite breathless by the 22-second manic percussion freak out of part 4. It's a shocking conclusion that leaves you wondering just what might come next. What follows is the golden light 70's dreamscape of Hazy Paradise. With its rich textures featuring Mellotron and lute, flowing guitars, and wistful falsetto vocals, it's in complete contrast to anything that has come before on the album. In fact, from here on out, Batoh and his cohorts prove they have no desire to stick to any particular style, cultural reference, or preconceived notions of song structure. Kiseichukan Nite weaves eastern tabla percussion with Celtic harp and recorder all as a backdrop to some brooding spoken word monologue in Japanese. The Piper puts bandmember Kazuo Ogino's talents with the harp and recorder to use again for a beautiful and haunting interlude before the whole band joins in for a Celtic inspired rocker. Ganagmanag returns for a time to the jazzy, 70's styled rhythms of the title track with Taishi Takizawa on groovy improvised flute before it dives headlong into a powerful, rhythmically complex percussion and piano workout that has a distinct cinematic feel to it. Feed treads into Floydian territory with its spacey slide guitar, lush piano, bubbling synths and dreamy, soaring chorus. Holy High is one of the best tracks on the album, again throwing in a bit of the Celtic influence, some energetic rhythms and swirling synths for a deliriously psychedelic blend. It may come as a surprise to some to hear such a strong Celtic influence coming from a Japanese band, but it should be no real surprise if one has listened to some of the beautiful harp and flute music of Japan, which has the same haunting beauty of its Gaelic counterpart. Admittedly, I kind of grew weary of the whole Celtic music thing years ago, but Ghost manages to revitalize the style in a refreshing, unique, and distinctly untraditional way. The album ends with an extraordinarily beautiful, elegiac take on the Syd Barrett number, Dominos, with gentle, strumming, acoustic guitar, flute, and vibes, before it takes a crazy sharp turn into the weirdly majestic, organ driven Celebration for the Gray Days as its finale. The album seems to be in a constant battle with itself between its over the top grandiosity and its subtle beauty. The musical tension is almost palpable, and it's difficult to do it justice with just words on the page. The diverse, eccentric, and ultimately exquisite Hypnotic Underworld definitely has to be heard. For more information, visit the Drag City web site at: http://www.dragcity.com.